As an emblematic artist of Mexico, world-acclaimed painter Frida Kahlo needs no further introduction. She once said "I paint flowers so they will not die." Like the flowers she immortalized in her art, the rose Frida Kahlo is a lively and colorful reminder of her enduring spirit. Just as Frida is one of the most recognizable artists for her unique style, the scarlet red and gold striped flowers of Frida Kahlo are also one of a kind in the rose world. The swirl of colors intensifies as the flowers age, adding a red blush as the final touch. Like any painting needs a good stand, the flowers are set in small clusters on a healthy disease resistant plant with clean glossy leaves. 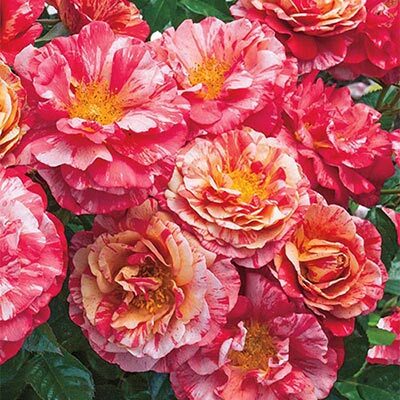 If you are one of Frida's followers or simply a rose lover, join the Fridamania by adding a piece of art to your garden with the striking vibrant rounded flowers produced abundantly on the compact upright vigorous plants.